Thanksgiving has come and gone, but if you are anything like me, you still have a lot of leftover turkey in your freezer. So the question remains...What do you do with all that left-over bird? 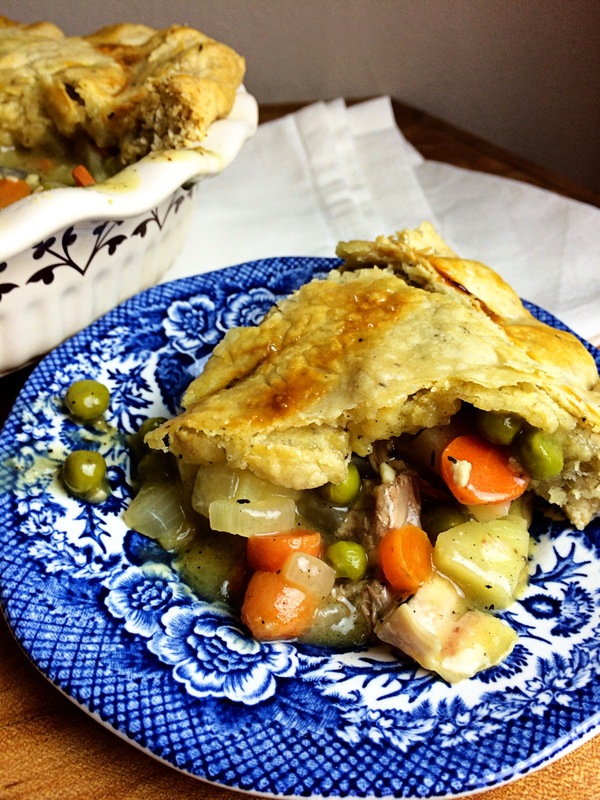 Well, one of my favorite dishes to make is Turkey Pot-Pie! It is so simple and you can put just about any leftover vegetables in it that you want. It is the perfect take-two recipe for your Thanksgiving leftovers and I can't wait to share it with you. To begin preheat the oven to 425 degrees. While the oven is preheating, take this time to make your pie crust. I like adding a little thyme and sage to mine for this dish. Let it rest in the fridge for 30 min. Then cut it in half, roll it out , place in a 9in. pie dish, and poke the bottom of the pie crust with a fork. While the pie crust is resting in the fridge, you can work on the filling. Add the butter and oil to a skillet and place over medium/high heat. Once the butter has melted add the onions and cook until soft and translucent. Then add the garlic. Cook the garlic until you can smell it coming from the pan. Now it is time to add the vegetables. My pan was a little dry so I added more butter. You can use your own judgement. After that I add the sage and thyme. I then let the vegetables cook for 10 min. Once the vegetables have started to soften, you will add the flour. Stir until all of the vegetables are coated with the flour. Then allow it to cook for 1-2 minutes, to cook the flour taste out. Now you are ready to add the chicken stock. Stir the stock and bring to a simmer. Allow the gravy to simmer until it starts to thicken, about 5-7 minutes. Once your gravy has thickened, add the turkey and taste for seasoning. Pour the pot pie filling into the bottom crust. Roll out the top half of the crust. Place it over the pie pan, tuck the excess under, and crimp. Listen, I will never win an award for pretty crusts, but they are tasty, and in the end that is all that matters...right? And place in it oven. Bake for 35-40 minutes until the crust is golden brown. Let it rest for 10 minutes and serve. Look at the golden and flaky crust. Oh and the gravy, let me tell you this gravy, it is INSANE! The vegetables are perfectly cooked! This is everything you want your pot pie to be! I know you and your family are going to love this! So don't let your leftovers get you down! 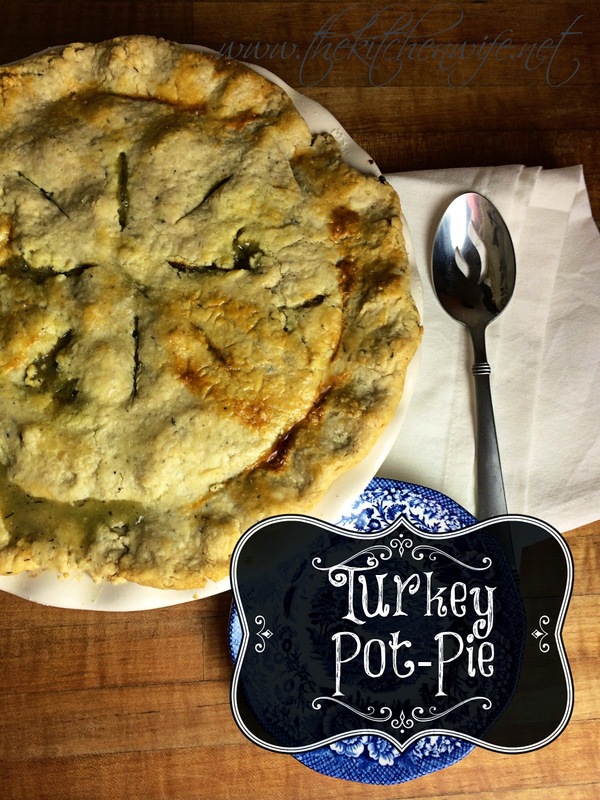 Give this great homemade Turkey Pot Pie a try tonight! You will be SO glad you did! While the oven is preheating, take this time to make your pie crust. Add the thyme and sage to the flour. Cut it in half, roll it out , place in a 9 in. pie dish, and poke the bottom of the pie crust with a fork. Add the sage and thyme to the vegetables. Cut a few vents in the top, brush with an egg wash (whisked egg with a little water). *Chicken can be substituted for Turkey.